Marine journalists from around the globe were taken on a guided tour of the 33-acre, 400,000-square-foot production plant in Wisconsin. 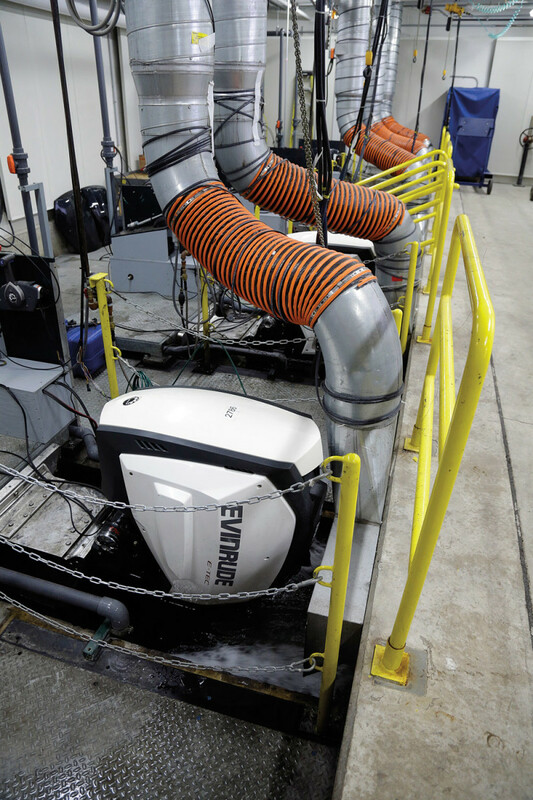 STURTEVANT, Wis. — BRP’s 2012 consolidation of its Evinrude outboard operations from Waukegan, Ill., to its plant here in Wisconsin was the start of a $15 million investment program focused largely on renovation and innovation. A tour of the Sturtevant plant reveals a clean, efficiently functioning production facility run by a team focused on constant improvement. 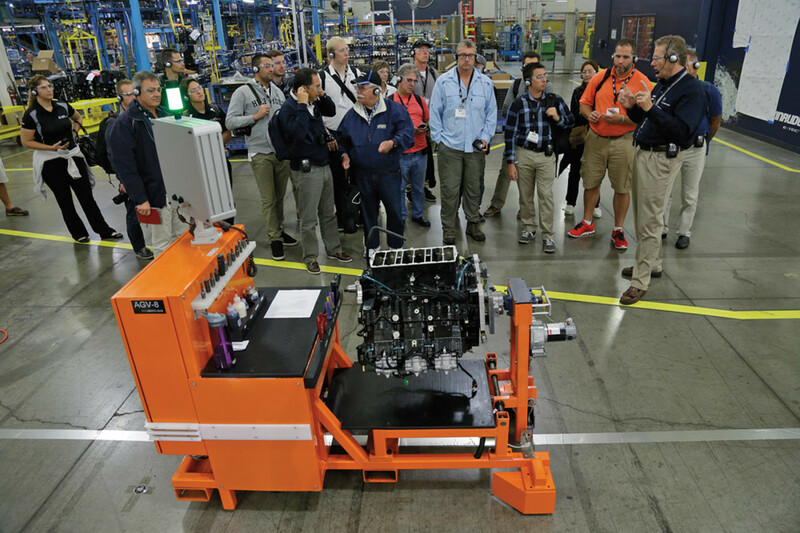 The plant, with its work crew of nearly 300, now builds the entire Evinrude line — from the 25- to 30-hp engines the company once manufactured in China to its jet propulsion systems to the new E-TEC G2 line that will debut to consumers in the fall. As part of the introduction of the G2 to dealers and marine journalists, plant manager Jason Conley led a tour of the 33-acre, 400,000-square-foot production plant, which includes a large, recently completed development test center built when BRP closed the Waukegan plant. The new campus now houses all staff and divisions of production — from accounting to engineering — under one roof. Inside the main entrance, the lobby makes an instant impression with an array of old Evinrude models through the years. “Yes, we’re an innovative company, but we’re very proud of our heritage and want to keep that on display,” says Conley. 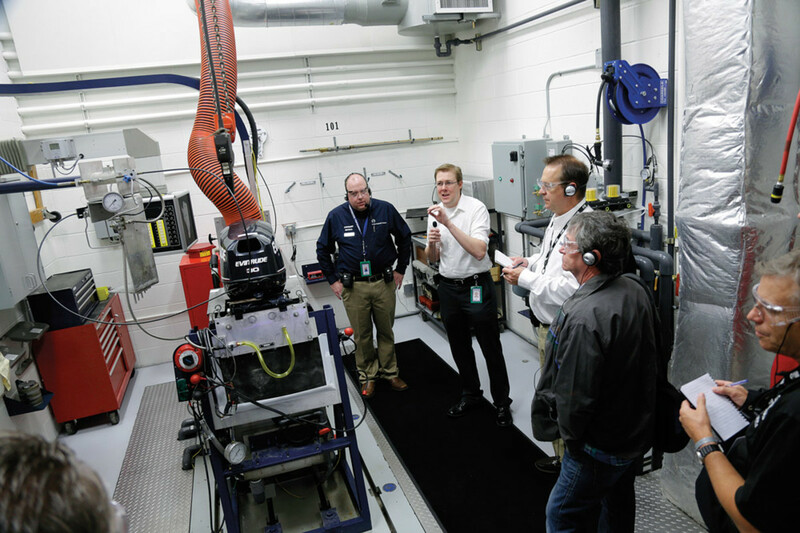 Beyond manufacturing, the facility includes a product-testing department; a rapid prototyping lab designed for speedy product development; rooms for dealer and technician training; and an emissions certification section that was completed about 18 months ago. There, each new engine is run in production tank testing under climate-controlled conditions while undergoing computer diagnostics for six to eight minutes. The emissions certification cells were opened about 18 months ago. The new endurance and durability lab where engines are run through the equivalent of 10 years of “normal operation” is built on top of a 500,000-gallon production test tank of water 10 feet deep. Each new engine is run under climate-controlled conditions while undergoing computer diagnostics for six to eight minutes. The emissions certification lab opened about 18 months ago. On the production floor, there are 125 workstations in the assembly area. Three-wheeled bicycles with baskets for tools are pedaled around the plant floor, making for efficient delivery. A good example of innovation in G2 production is a system of wirelessly controlled “automated guided vehicles” — carts that move an engine in production from station to station. Technicians working on them can rotate the mounted engines, as needed. At each stop, a video display shows the next technician in line and which step in the process he is tasked with, including diagrams and the tool for the job. The system was launched this year and its remote carts were developed in-house, Conley says. The plant runs a mixed-model production line, with a variety of engines moving down the line side by side. A tracking system pinpoints an engine’s station and the work done from start to finish. For G2 production, BRP developed a fleet of wireless-controlled "automated guided vehicles" - carts that move an engine in production from station to station. BRP’s Hawk line of low-horsepower outboards (3.5 to 15 hp), which had been made in China by Tohatsu, has been brought back to the United States, and the engines now are made in Sturtevant, Conley says. “Machining is our core competency here at Sturtevant,” he says, noting that about $8 million has been invested in improving machining capabilities during the past two years. The company is investing in a material management system set to go online this year, Conley says. In anticipation of heavy ordering for the new G2, the plant already is prepared to increase capacity as needed. Although consumers won’t see the G2 for another few months, more than 100 have already been built at Sturtevant — the largest pre-launch production ever, according to the company. Each G2 requires two days of production time. The goal is to have new engines in dealers’ hands within five days after production. “We will keep ahead of customer demand,” says Frank Bailey, director of operations at the plant.